With the increase in invention; more machinery and the need for more power the industrial revolution brought a new method of power; Water & steam. Before 1700, industry was run predominantly by human and animal power, Farmers in the field and animals assisting them with the daily rigours of work. There was also that from nature in the shape of wind and water. As this demand increases water became one of most important powers and thus the driving force behind the industrial revolution. The inventions at the beginning of the industrial revolution most notably the Spinning Jenny, the Water frame & the Spinning mule all required some level of power to function. This led to the discover of water power and of course steam power which later followed with the invention of the steam engine. Water was used in conjunction with the Water frame invention by Richard Arkwright to power the whole production cycle in large factories. Giant water wheels would sit next to the factory and drive production through the flowing over water over the machine. The water would be powered downstream in a river to turn the machinery. It is suggested that water power was nothing new and it had been in use for approximately 2000 years yet the way factories used water to increase the production line was the change. Coupled with the inventions of the industrial revolution the water wheels could power machines to streamline the textile processes. Power to sawmills allowed for the carving of lumber logs effortlessly and the grinding of grain flour could be simplified through power to Grist Mills. Water wheels in conjunction with the new inventions allowed for this. Water power relied on great weather conditions and relied upon the building of a factory next to a river. Low rainfall and drought in the summer or ice in the winter could stop them turning and seize production speeds significantly. Furthermore the damming of the river meant that other uses of the river including fishing and leisure were often compromised and interfered with. 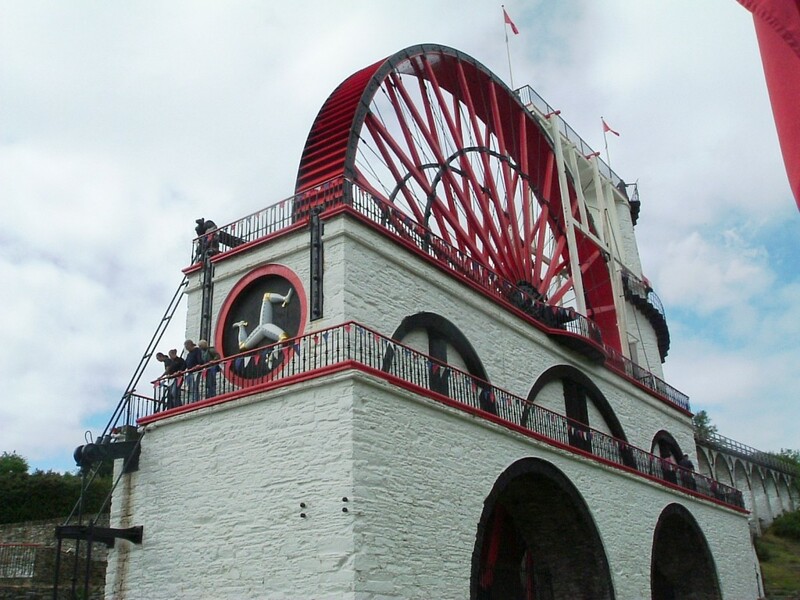 The Isle of man still has a huge water wheel you can actually visit. This is at Laxey within the Isle of Man. It was built in 1854 and is a huge 22 metres across and it’s prime use was to pump water to the nearby lead mine. It’s estimated the wheel could lift 1,000 litres a minute. Steam power again was nothing new however key inventions and it’s crowning moments came to fruition within the industrial revolution. The devices previously were expensive and extremely limited however at the beginning of the Industrial revolution came a practical element to the inventions. The premise was simple. Boiling water was used to create a mechanical motion and was the driving force behind a number of inventions including of course the steam engine train. It’s argued that steam was one of the most important aspects of the Industrial revolution. The steam engines were extremely popular within the mining industry but began to be used in a number of industries throughout the revolution. The benefits of the steam process over water was that it didn’t vary by season like water power. It could also be located anywhere meaning factories didn’t need to be close to a water source for production to be at it’s peak. The introduction of steam power was a vital breakthrough in terms of productivity and efficiency and by 1800 there were approximately 1,250 steam engines running throughout Britain. Not to mention the adoption of this method throughout Europe and North America. Steam engines are a great example how industrialisation led to changes across all areas. The use of steam became popular within transport and these technological advances are credited to the industrial revolution and the change of attitude brought by this period. Both steam and water played an essential role in the productivity and output of factories throughout the industrial revolution. It’s often said that these two power sources and the inventions they powered were the driving force behind the shift from the domestic system to the factory driven environments we saw throughout this key period.